Do you ever worry about fitting in? Read this. Sherbet-rainbow-coloured joy in book form. Elmer the patchwork elephant really stands out. Firstly, he looks like a walking rainbow. Secondly, he loves to play cheeky jokes. We think it’s awesome to be as unique as Elmer. But one day, he feels tired of being different. So he paints himself grey to blend in with his herd. Hmmm. How long do you think he can hide his true colours? (Clue: not long!) David McKee has given all of us something very special and unique in this joyful classic. Colour your own patchwork Elmer the elephant. 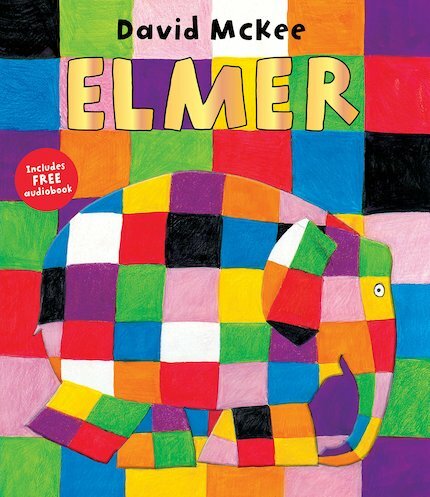 I think Elmer is a good story because it shows you can be different. I like Elmer series. He’s an adventurous elephant.